The 2017 Summer FabFitFun Subscription Box is simply amazing! A couple weeks ago I received an email from FabFitFun with a discount offer to purchase the 2017 Summer box. It’s actually been a long time since I’ve order one of these subscription boxes, but the email included full spoilers. I knew right away that I had to have this box. 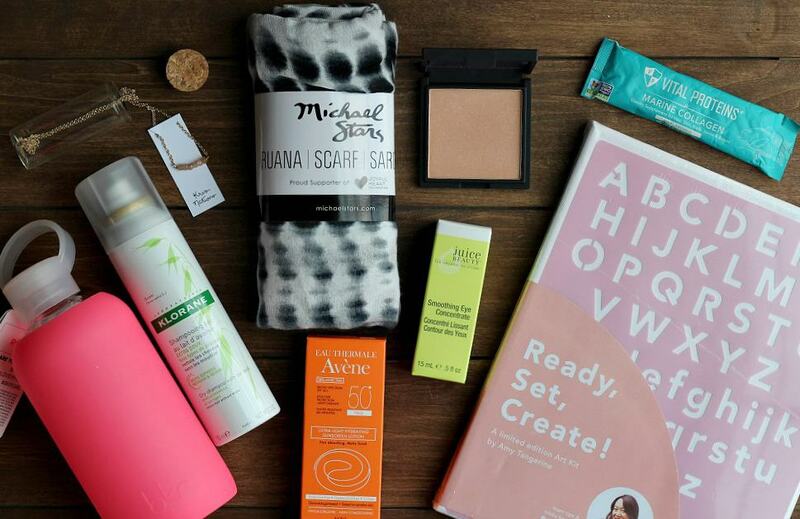 FabFitFun is a quarterly subscription box. Every season they send a big box full $200+ worth of the latest beauty, workout, and lifestyle items perfect for that time of the year. The regular price is $49.99/quarter or you can pay $179.99/year and get additional perks like the ability to customize your box when there are variations of different products, and early shipping! The items below have a total retail value of $272.00 and are what I received in my box. I will note which items have other variations that you might receive should you choose to order a box or yourself! BKR Little – 500ml ($35.00): I love that I got this water bottle in pink, but it comes in blue as well. This is a glass bottle with a rubber sleeve around it to help keep it from breaking. It’s perfect for taking to the gym, or just on-the-go! 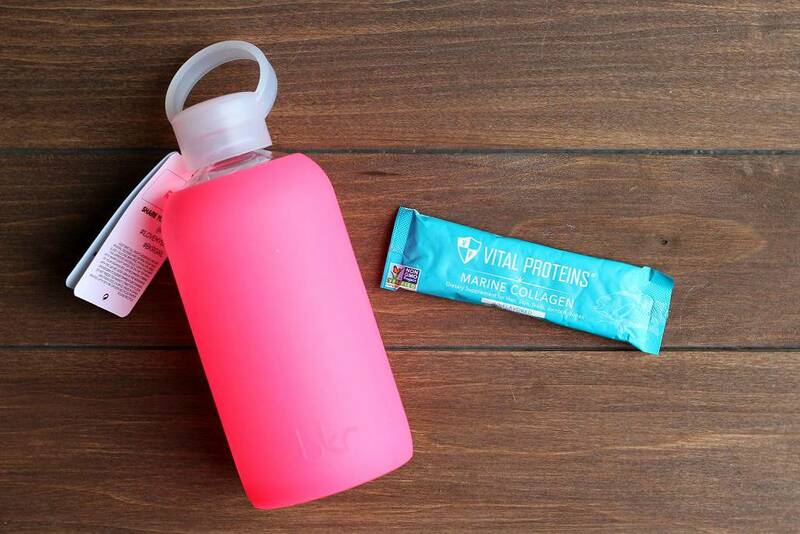 Vital Proteins Marine Collagen (sample): this is an unflavored collagen supplement that you can mix into any beverage. Collagen helps your skin appear healthier and more vibrant. Obviously a single serving isn’t going to make a dramatic different, but it was a nice bonus to try. Avène Ultra-Light Hydrating Sunscreen Lotion ($24.00): this is actually pretty small, considering it’s full size. However, the smaller size is really convenient for tossing in my bag when I’m heading out with the kids. I’ve used this sunscreen before and it’s not that greasy and doesn’t irritate our skin at all. Juice Beauty Smoothing Eye Concentrate ($29.00): Juice Beauty products show up often in subscription boxes but I’ve never tried their eye cream before. I love that these products are organic and free from yucky ingredients like parabens, phthalates, and more! 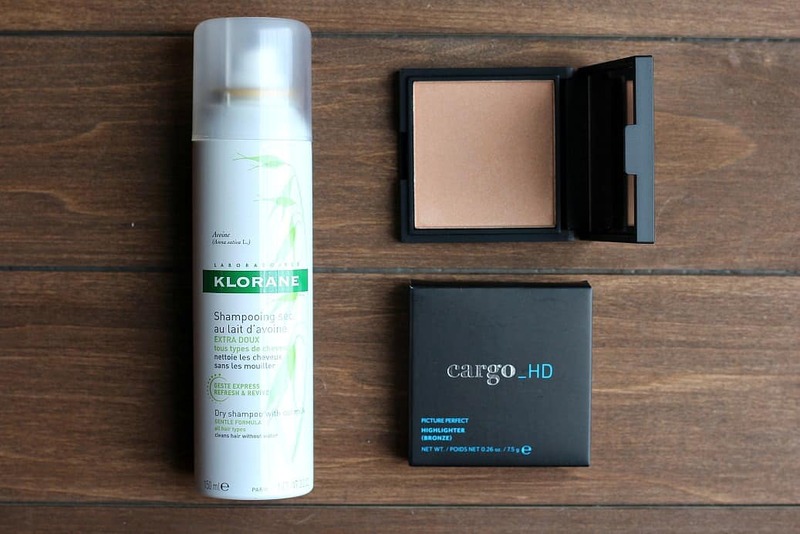 Klorane Dry Shampoo with Oat Milk ($20.00): this dry shampoo is really popular and I have read tons of good reviews! I don’t usually use dry shampoo because I have dark hair and it shows, but it’s been so hot this summer, that I might just give this one a try anyway! **Annual subscribers could have chosen to receive Way of Will 03 Soothe and Cool Massage Oil instead. cargo_HD Picture Perfect Highlighter in Bronze ($30.00): I love highlighters! This one is a bit darker than I typically use but I am very excited to give it a try (especially with the spray tan I have going on ha!). The package says it’s formulated for high definition filming, so your skin should look great in photos, while your makeup remains natural looking. 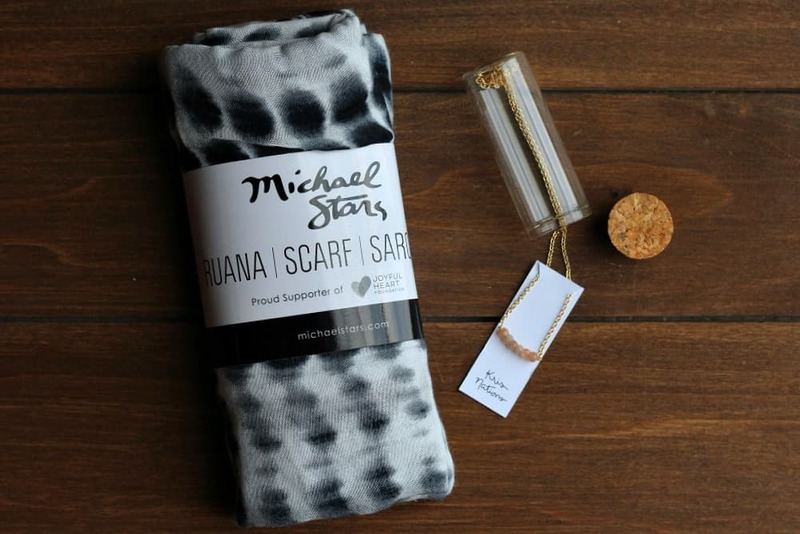 Michael Stars Ruana ($54.00): subscribers will receive one of 3 different variations of this item. Annual subscribers have the option to choose which variation they want. I got the black and white and love it! There is also a blue/black and an orange/purple/cream variation. You can wear this as a light scarf, a sarong, or like a shawl. 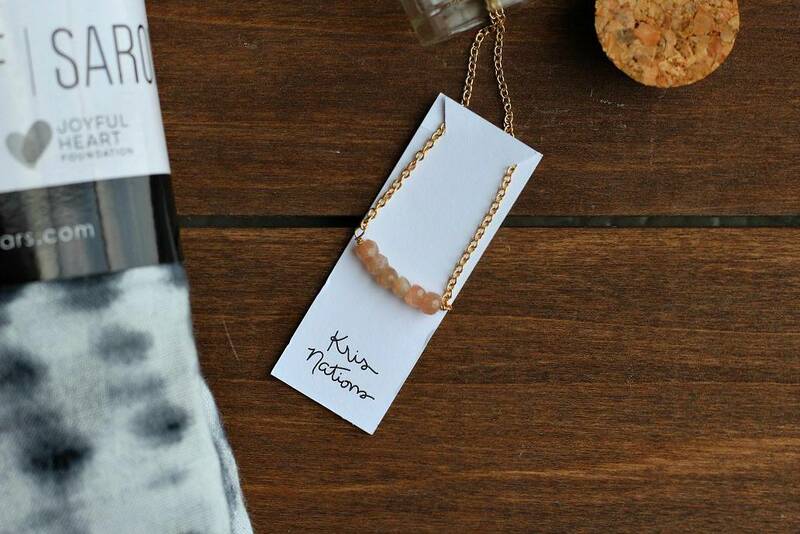 Kris Nations Mystic Bar Necklace ($58.00): this necklace comes in 3 variations that annual subscribers get to choose from as well. I received the moonstone (peachy pink) variant. It’s perfect! The card states that Moonstone provides strength, inner peace, and growth – all great things! The chain is 18K gold overlay and is adjustable from 16-18 inches. The other variations are turquoise and howlite (white). Ready, Set Create Art Kit ($22.00): annual subscribers got to chose between this art kit, a Himalayan salt kit, or a vegan leather passport and luggage tag. Being that this blog is mostly food-related, if I could have, I totally would have chosen the salt! 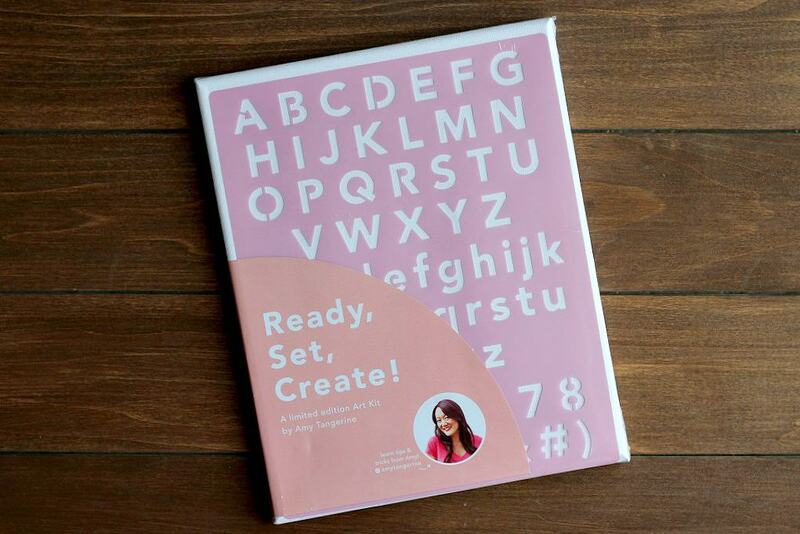 The art kit comes with a canvas, brushes, acrylic paint, and an alphabet stencil. It will still be fun to use to create something with my littles. There are still limited quantities left of the 2017 Summer FabFitFun box, so if you are interested, order quickly! You won’t be able to chose your variations, but if you sign up for the annual subscription, when the Fall box choices are available you will be first in line! 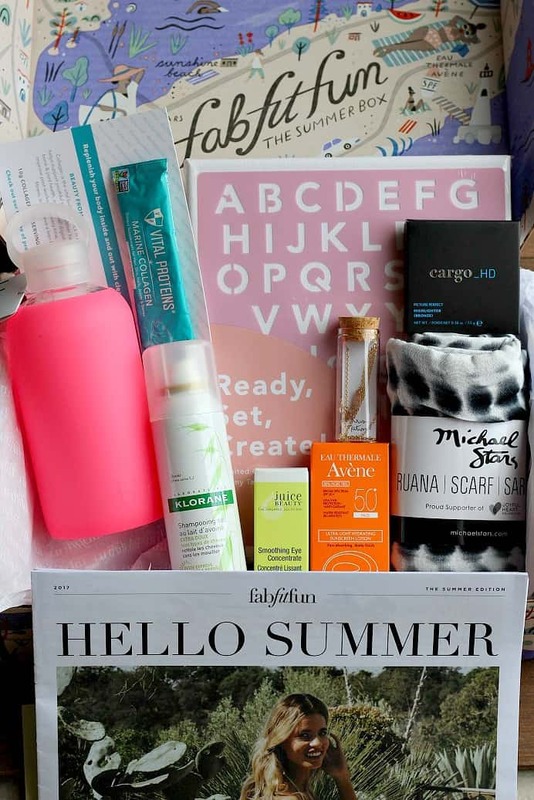 After seeing how much I love this summer box, I might just have to break down and order the annual subscription myself!